Big day here on Good House Guest: our second guest post comes from the very first rate Jane Lerner. In addition to being a top-notch writer and editor, Jane throws an excellent party, always suggests just the right restaurant and is the woman to call about a food adventure. Plus, she shows up with treats from one of her favorite neighborhood spots or her magic kitchen. Jane’s granola recipe is a secret I’ve been after for awhile now, so I’m thrilled she is sharing it with GHG. Thank you Jane! Connect with Jane on Twitter and be sure to check out her gorgeous new website. You’ll love Jane as much as her granola. I host a lot of house guests. There was one stretch in late 2010 where 14 different sets of guests stayed in my apartment over a four-month period. Granted, I have a spacious three-bedroom apartment in a popular part of Brooklyn, and when I moved in I extended an open invitation to all of my friends. Problem is, everyone took me up on it. I love having guests in theory, but I have learned—the hard way—that I contain a finite amount of hospitality. My sincerest apologies to those friends who stayed with me when I was at the end of my gracious-host rope. At the conclusion of that 14-guest run I was ready to relocate to a 300-square-foot studio just to discourage anyone else who might want to visit. Luckily my friends are wonderful people, most of them with good manners and a real consideration for the fact that staying in someone’s home means that a gift is in order. I’ve received a colorful cutting board, a gigantic jar of local honey and an array of specialty foods from the gourmet shop down the street, but truth be told the best present is a guest who does the dishes, is fun to hang out with and doesn’t burn the house down (yes, a few folks have introduced fire into the equation). Homemade gifts are especially sweet, and if you’d really like to warm the hearts of your hosts, may I recommend whipping up a batch of granola to present as a pre–thank to get in good graces the minute you step over the threshold. This granola is a mishmash of a few recipes I’ve tried over the years, and I think I’ve hit upon the perfect version. As a friend recently emailed, after sampling a batch of the stuff: “Your granola game is tight. Best I have ever eaten!” Package it in a large Mason jar and add a little tag that says, “THANK YOU!” I guarantee that no one will complain about you on Good House Guest ever again. Preheat oven to 325°. In a large bowl, combine oats, nuts, cardamom, salt, olive oil and maple syrup. The mixture should be well coated but not super wet. Spread evenly on two large baking sheets, put in oven and bake for 20 minutes until the mixture is a toasty light brown, stirring two or three times. Add in the coconut flakes and coconut cubes. Bake for 15 minutes more, stirring once or twice. The granola should be a dark golden brown—monitor it closely to avoid burning. Remove pans from oven and let cool on racks. Stir in dried fruit. Transfer to a few large Mason jars and give away as gifts. Adapted from/inspired by published recipes from Mark Bittman and Early Bird Granola. 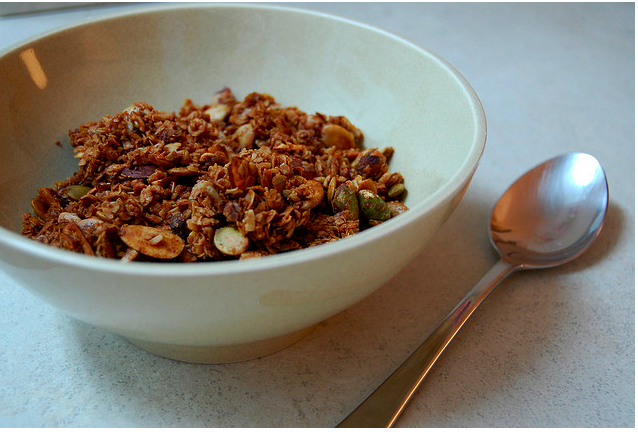 This entry was posted in create and tagged Early Bird Granola, Jane Lerner, Mark Bittman by lhouse. Bookmark the permalink. I’m making this as soon as possible!! It sounds awesome. And while reading your post, I remembered how important it is to thank family hosts as well. Sometimes it’s easy to take for granted the most selfless of hosts who happen to be related.